Pound 4 Pound Boxing Report Podcast 6.27.14 – Guerrero and Kamegai GO TO WAR! 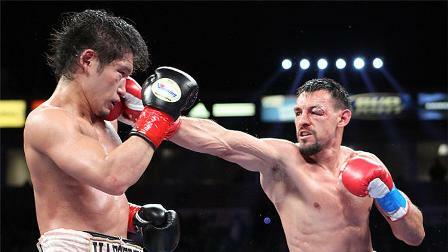 – Robert Guerrero and Yoshihiro Kamegai engage in a grueling war with Guerrero winning by unanimous decision. Did this bout raise more questions for Guerrero than solve answers. – Vasyl Lomachenko impressively defeats Gary Russell Jr. to win the WBO Featherweight title. Could a Featherweight tournament be on the way in 2015. – Devon Alexander defeats Jesus Soto Karass. What is Alexander’s future at Welterweight? – Chad Dawson KO’s George Blades in one. Even in victory, did “Bad Chad” lose? – *Warning… Boxing Geek Alert* Hekkie Budler KO’s Pigmy Muangchaiyaphum Kokietgym to defend his WBA Strawweight. Why Budler, a Strawweight, is a fighter worthy of paying attention to? – Why Martin Murray’s impressive win over Max Bursak should put him back into title contention? – Golden Boy Promotions files a $50 million lawsuit against Richard Schaefer. – British promoter Eddie Hearn of Matchroom Sport is planning on invading America.